They have been announced, and so today is sort of a "WOW!" day. Why? This year they are inducting five new members to the USATT Hall of Fame - most years it's two or three, but this year we're inducting a basketball team!!! This year's inductees are Li Ai, Dhiren Narotam, Norm Bass, Henan Li Ai, and Doru Gheorghe. The induction ceremony for all six of us will take place at the USA Nationals in Las Vegas, on Thursday night, July 5. This could also be called the "Resident Training Program" (RTP) induction ceremony, as four of the honorees were from that program at the Olympic Training Center in Colorado Springs, circa 1985-1992. I was part of it from 1985-1990, at varying times the manager, director, and (mostly at the end) one of the coaches, and as chair of the RTP Committee. Li Ai and Dhiren Narotam were players there. Henan Li Ai was the head coach for about five years. I worked closely with Doru Gheorghe during his years as USATT Executive Director and as Chief Operating Officer and High Performance Director. However, I don't believe I've ever met Norm Bass, but I'm dying to meet him at the induction ceremony - he's not just a table tennis player, but he's a former major league baseball player (a pitcher) and NFL football player! (Here's his autobiography, Color Him Father: An American Journey of Hope and Redemption.) Maybe he can show me how to throw a slider? Since I mentioned basketball above, I must mention that Dhiren was good at it - very good, as I played with and against him many times during our years at the RTP. I have many fond memories of playing on Dhiren's team. I couldn't dribble to save my life, and when I'd get the ball, if I was covered, I'd be stuck - but Dhiren, aged 13-16 during those years, would always get open so I'd have someone to throw the ball to. But I was, and always will be, the King of the Two-Footer, as long as I wasn't covered and had enough time to take careful aim. Since this is my "day" (along with the other five), I'm going to go ahead and post the bulleted list on me from the USATT announcement. Feel free to skip ahead to the more interesting articles afterwards! Author of 8 books, about 1600 articles, and (at tabletenniscoaching.com) over 1800 blog entries on table tennis. Editor of USA Table Tennis Magazine for 12 years, 71 issues. Editor of nearly 200 table tennis program booklets and newsletters. USATT Certified National Coach and ITTF Level 2 coach. Two-time USATT Coach of the Year (Developmental and Science Awards), three-time runner-up for Coach of the Year. Many-time coach of USA Junior National Teams, coaching them at camps and at tournaments around the world. Coached over 250 gold medalists at the U.S. Junior Nationals and Junior Olympics. Ran over 100 five-day training camps. That's 500 days just running table tennis camps, and is in addition to running weekly group sessions for many years. Manager/Director/Coach, USATT Resident Training Program at the Olympic Training Center in Colorado Springs, 1985-1990. The majority of his 8 books and 1600+ articles on table tennis are coaching related. Founder, head coach, and daily blogger since 2011 at TableTennisCoaching.com. Professional coach at Maryland Table Tennis Center since 1992 with about 30,000 coaching hours. He's been late for a session exactly two times. Pioneered the idea of full-time table tennis training centers by opening the Maryland Table Tennis Center in 1992 (with Cheng Yinghua and Jack Huang), the first successful full-time table tennis center in the country. The model has been copied all over the U.S.
Instigated & created (with Robert Mayer) the USATT League Rating System, now used in clubs all over the U.S., processing more matches than the USATT tournament rating system. Created the Club Catalyst and Creation Program, which in 1990-1991 increased the number of USATT clubs from 226 to 301, and membership from 5500 to over 7000. Arranged over 100 TV showings on CNN, Headline News, ESPN, Nightline, and on local stations, and many hundreds of newspaper articles. Director of over 200 USATT sanctioned tournaments, nearly all of them two days long. That's over 400 days just running tournaments. Wrote the original draft to cancel the infamous Paddle Point Rule. Reached #18 in the country, won Open Singles at 18 tournaments, and was National Collegiate Doubles and 2-time Team Champion. Though he normally uses sponge, at the U.S. Open and Nationals he was 2-time Hardbat Singles Champion, 5-time Hardbat Over 40 Champion, and 14-time Hardbat Doubles Champion. Has played or coached at 42 consecutive North American/U.S. Open Teams (1976 to present), 34 consecutive U.S. Opens, and 34 consecutive U.S. Nationals. Is about 2100 with a clipboard!!! Here are the results, are of Omnipong. I ran the 3-star tournament this past weekend. (I should have linked to the results in my mini-Monday blog - they were up already.) The tournament has already been processed - here are the ratings. I did one thing at this tournament I hadn't done before - I set up a table next to the control desk and exhibited and sold all 13 of my table tennis and science fiction books - I ended up selling 18. The USATT news page has 12 new items since my last blog. Here they are! Ten Tactical Timeout Tips. "Many international matches have been won or lost based on WHEN the timeout was called and WHAT was said during the timeout. In this short article, I’m going to give some brief tips about timeouts…"
Spin Videos. "Most of the questions that I receive are about spin - importance of spin, types of spin, how to read spin, how to generate spin, how to generate more spin, etc... Today, I wanted to share some of my best videos on spin." Here's the video (3:53) from Arnaud Scheen. Calderano is the world #12 from Brazil. I’m Now a Full-time Table Tennis Coach! Here's the ITTF article. There are 21 candidates for five positions, including USA's Jasna Rather and New Zealand's Matt Hetherington (who currently coaches and trains at the Lily Yip TTC in New Jersey and is USATT's Media & Communications Director). USA's Ashu Jain is currently the Vice Chairman of the Commission, with Vladimir Samsonov the Chairman. Others of interest among the 21 include Wang Liqin, Zoran Primorac, Jean-Michel Saive, Krisztina Toth, and Claude Bergeret. Who Will Create History at the 2018 World Table Tennis Championships? Here's the ITTF video (46 sec). The World Team Championships are April 29 - May 6, in Halmstad, Sweden. Here's the video (14:18). I linked to two previous ones, but this is probably the best of them. Here's the video (65 sec). But don't they get a lot of concussions? Unless it's a ping-pong ball or nerf ball, I'm going to say no to hitting a ball with my head. You also head the ball in soccer - no thanks - but that's only occasionally, while this is nonstop. Here's the picture! (Here's the non-Facebook version.) As near as I can count, there are 57 rows of ten tables (including that block of tables on the back right), or 570 tables, but there might be more above or below the picture. I'm guessing this is in China. Because I'm totally exhausted from running the 3-star Butterfly MDTTC April Open this weekend, plus teaching a class Sunday night. Because I have to put together the write-up, formatted results, and photos for the tournament. Because I have to do catch up on some writing projects. But to tide you over until Wednesday, here's Ukulele Pong (14 sec), with Mary Lieu! Why would you go to a table tennis camp? The simple answer is . . . to get better. But many would say, "I can train at my home club, why go to a camp?" At a camp, besides getting expert coaching, you get intensive training typically for five days, which is enough time to dramatically improve your game. This type of saturation training will lead to far more improvement than just practicing on and off for longer periods of time. Plus, it's a memorable event - you love table tennis, and this is a table tennis vacation! Some of my best table tennis memories are from the late 1970s when I was a regular at the Seemiller Camps. (I've emailed to see whether Dan is running camps this summer.) But I do suggest researching the camps and finding the perfect one for you. Some are primarily for kids; others are for all ages. Maryland Table Tennis Center. I'm one of the ten professional coaches at MDTTC (plus a number of part-time ones). We run camps all summer, Mon-Fri, June 18 - Aug. 31 (except for July 2-6, during the U.S. Nationals). The camps are primarily for kids of all levels, but adults are welcome too as long as they don't mind training with the kids around their level. Samson Dubina Mega Camps. They are June 4-7, 12-15, and July 18-21. They are for players of all ages and levels, and get huge numbers of players. Lily Yip Table Tennis Center. They run camps all summer in Dunellen, NJ. New Jersey Table Tennis Club runs camps all summer in Westfield, NJ. Princeton Pong runs camps all summer with Coach David Zhuang in Princeton, NJ. Westchester Table Tennis Clubs runs camps much of the summer in Pleasantsville, NY. Wang Cheng Table Tennis Center runs camps all summer in Upper West Side, NY. Triangle Table Tennis runs camps all summer in Morrisville, NC, with Coach Brian Pace and others. Atlanta International Table Tennis Academy will run three camps, June 4-8, 11-15, 18-22, 25-29. Thomas Keinath Camp. He will be running a camp June 10-13 at the Broward TT Club in Davie, Florida, in part to help prepare players for the upcoming World Veterans Championships, June 18-24. World Champions Table Tennis Academy. They run three camps in in June Santa Clara, CA, with coaches Li Zhen Shi, Zhang Li, Stefan Feth & Nan Li. ICC Table Tennis runs summer camps all summer in Milpitas, CA. Pleasanton Table Tennis Club runs camps all summer in Pleasanton, CA. Attila Malek Camps at Powerpong. They run camps all summer in Costa Mesa, CA. Fremont Table Tennis Academy runs camps all summer for players ages 5-18 in Fremont, CA. TT America runs camps for kids all summer in Fremont, CA. Pong Planet runs kid-focused summer camps all summer in San Carlos, CA. TopSpin Table Tennis runs kid-focused camps all summer in Santa Clara, CA. Seattle Pacific Table Tennis Club runs camps all summer. Houston International Table Tennis Center is running camps all summer, but their info page is in Chinese. I used Google translate to read it. Zoran Primorac Camp (web page appears to be in Croatian, alas) in Pula, Croatia, July 21 - Aug. 4. I have a flyer for the camp. Cost for the two weeks is $2750. You can email them. TTPor runs camps in Setubal, Portugal (on the coast near Lisbon) run by "dynamic father-son duo Domingos and David Diniz." B75 Bordtennis runs 3 weeks of camp in July in Denmark for all ages and levels. Here's the profile I wrote of MDTTC! It actually started as an interview by Steve Hopkins of me for an article he was going to do, but he decided to mostly just reorganize my answers and publish it as an article by me, which was fine. Here's the ITTF home page for the event, which finishes tomorrow in Zagreb, CRO, April 10-14. Here's the ITTF home page for the event, which finishes this Sunday in Oxenford, Australia. Here's the interview (written) with Tahl Leibovitz by Ryan Green. Here are recent articles from them. Here are the two videos (18:06 and 24:59). "World Cup Champion Dima demonstrates his unyielding concentration, tremendous forehand and backhand topspins while never giving up the table. Watch the extreme wrist angle change on Dima’s forehand to backhand combo to understand why his backhand attack is so spinny! Table Tennis BelgiumTV provides a real treat to watch Anton and Dimitrij show how the Pros do it in the training hall." Here's the video (4 min). Timo's the lefty, not sure who the other player is. Here's the video (22 sec). Why haven't you done this? Here's the video (5 min) as Jishan is interviewed by Al Herr at the Butterfly Cary Cup. Jishan will be playing in the MDTTC Open this weekend, which I'm running, and is in fact staying at my house for the weekend. Here's the article on Chinese difficulties in winning the Asian Cup, by Steve Hopkins. Here's the ITTF article that features USA's Amy Wang winning her group at the Croatia Open. Here's the issue that came out Wednesday. Here are numerous links to them from the Mytabletennis.net forum. Here's the video (52 sec) from Keenan Southall. U.S. Nationals Entry Form. Here it is! (I'd use the pop-out version - easier to read and print.) Hope to see you there - I'll be there. USATT Board Meeting. We had a teleconference at 7PM Monday, which lasted over two hours. Main topics included approval of the minutes of the March 12 and 26 teleconference meetings (they should go online soon on the USATT Minutes and Actions page); notice and discussion of a potential new bylaws involving USADA for compliance with the Ted Stevens Act; Discussion about Para Data Protection Guidelines; Discussion about USTTA Foundation and USATT Financial Statements; and Events Update (World Veterans, 2018 U.S. Nationals, 2018 U.S. Open, and 2020 World Championships). We also had a close session that took up almost half the meeting. Beginning Junior Class. We started a new ten-week beginning junior class this past Sunday at MDTTC, with 13 kids. Surprisingly, most of them were returnees from the previous session. As I always do in the first session, I gave a short demo and lecture on grip, stance, and the forehand, but since so many were returnees I went shorter than usual so I could get them out on the table sooner. I may shorten this even more next week. Talent Program. We started the Sunday session with serve practice, and I was flabbergasted at one 7-year-old - in a good way. Three weeks ago he literally couldn't get backspin on his serve; now he was able to serve with enough backspin to make the ball bounce back into the net. Guess who's been practicing his serves a LOT? He was very happy that we noticed, and I made sure the other coaches also saw it. The rest of the session I fed multiball (topspin only due to my shoulder) - lots and Lots and LOTS of footwork drills. Potomac Pizza on Thursday. On Thursday, April 12 (tomorrow), from 4-9PM, Potomac Pizza at the Traville Gateway Center in Rockville will donate 20% of all proceeds. Here's the promotional flyer! You may either bring this flyer with you or tell your server that you’re here to support HW GLOBAL FOUNDATION and they will add you to the totals. I teach a class from 6:30-7:30PM, and plan to drive over right afterwards, probably arriving around 8PM. Hope to see some of you there! Butterfly MDTTC April Open. I'll be running the MDTTC April Open this weekend, April 14-15, in Gaithersburg, Maryland. Deadline to enter is 7PM on Friday. It includes a link that allows you to enter online through Omnipong, as well as a link to the PDF entry form you can print out. Events are Open, U2400, U2200, U2000, U1900, U1600, U1300, U1000, Over 50, Under 15, and Under 12. Don't miss the great Promotional video (2:32) put together by Mossa Barandao of Pongmobile! Also, the HW Global Foundation Talent Program Kids will hold a bake sale at the tournament - come support them! Shoulder Update. I went to the club twice recently to experiment feeding multiball left-handed, since (as I blogged last week) it puts great pressure on the shoulder when I feed backspin repetitively. The first time was on Saturday, but I'd forgotten about the Capital Area League, and they were using every table. I went over early on Sunday (before my two 90-minutes classes), but the robot table (with the net I was going to practice into) was being used. Since nearly all the other tables were also being used, if I used another table I'd have been scattering balls in their courts. So I still haven't tested this. I will likely do so tomorrow - hopefully. Yesterday's Critiquing. As noted in my mini-blog yesterday, I took yesterday off so I could read and critique seven science fiction & fantasy stories for upcoming workshops. (Okay, this isn't a "Table Tennis Happening," but I'm a Table Tennis Person doing it, so close enough.) I started at my desk at 8:30AM and worked until 10AM. Then I drove to Lake Forest Mall (about ten minutes away), and found a table by a window in the eatery, and worked there from 10:30AM to 6:30PM!!! (Pizza for lunch, Bourbon chicken for dinner, while sipping on a huge Dr. Pepper that lasted me all day.) Then I stopped by the club (one mile away) to pick up entry forms for the upcoming April Open and the Hopes Trials and chatted with players for a time. Then I went home and worked there from 8:30PM to 2:00AM - which is when I finished! I do rather extensive critiques. Alas, I'll have another set of stories to critique in May, and one more in June. Is Truls Möregårdh Sweden's Phoenix Flame? Here's the USATT article by Ray Huang. "Just four months ago, Truls Möregårdh of Sweden burst out of the blue to take the silver medal at the 2017 ITTF World Junior Championship, defeating Chinese players Niu Guankai and Xu Haidong in the quarterfinal and semifinal stages. At only 15 years of age, he is also the youngest player to ever compete in the Champions League. Many have eagerly predicted that Truls Möregårdh can become the next Waldner. But where exactly did this youngster come from?" ​Here's the ITTF article. "The Mentorship Programme matches coaches from around the world with top-level mentors; they work with their mentees through numerous skype and face-to-face sessions." Here's the article on the tournament in Great Neck, NY. "Table Tennis stormed its way into Great Neck on Sunday, March 11, as more than 100 students representing 22 different schools participated in the Third Annual Great Neck North High School (GNNHS) Table Tennis Tournament." Here's the USATT article by Dev Dassarma. Here's the USATT article by Robert Ho, on the 2016 Pyongyang Open, "North of Korea’s Mason and Dixon Line." Here's the video (2:11) as Bob Mankoff from The New Yorker introduces you to his table tennis robot, then shows us five table tennis cartoons that have been published in The New Yorker. I have to take this morning off from blogging. I'd like to say it's for some big table tennis reason, but actually it's because I'm in a pair of upcoming writing workshops, and have to read and do extensive critiques on seven science fiction & fantasy short stories. Don't worry, I'll be back to table tennis tomorrow! (Actually, I also have to do player evaluations for about ten junior players from our Talent program, so as soon as I finish the SF critiques I switch back to TT.) I plan to spend the day working at the eatery at Lake Forest Mall, so if you are local, stop by and say hello. (But I really, Really, REALLY need to get this work done, so no more than a few minutes and then I have to get back to work.) But to entertain you this morning, here's Plate Bouncing Pong (31 sec)! How to Return Nets and Edges. Susan Backed Pingpong Parlor Coming to D.C. - SPiN Washington! Their location is right in the middle of DC, which according to Google Directions is just over 30 miles driving distance south of my club, MDTTC. So there's no serious conflict between the clubs - and as I've blogged before, having multiple full-time clubs in one region, but not too close, actually helps all of them as each club brings in new players who might also join or attend tournaments and leagues at the other clubs. While MDTTC focuses on serious training, SPiN has great food - here's the rather extensive NY menu. They have pizza!!! They also serve alcoholic beverages. MDTTC has water and gatorade. Assistant General Manager, Banquet Captain, Bar Manager, Barback, Bartender, Busser, Chief Brand Officer, Cook, Corporate Chef, Creative Project & Design Manager, Design Assistant, Digital Marketing Director, Director of Sales, Dishwasher, Event and Program Coordinator, Event Sales Coordinator, Event Sales Manager, Executive Chef, Facility Technician, Floor Manager, General Manager, Guest Experience Leader, Host/Hostess, Lead Bartender, Lead Host/Hostess, Lead Line Cook, Marketing Coordinator, Passer, Payroll/Benefits Specialist, Server, Sous Chef, Trainer. Washington DC already has Comet Ping-Pong (a pizza place with ping-pong tables) as well as the Washington DC Table Tennis Center, so it's a growing area for table tennis. Maybe we can attract more and more players from there for our MDTTC tournaments - and speaking of that. . . . I'll be running the MDTTC April Open this weekend, April 14-15, in Gaithersburg, Maryland. Deadline to enter is 7PM on Friday. It includes a link that allows you to enter online through Omnipong, as well as a link to the PDF entry form you can print out. (Note - this is the 199th USATT sanctioned tournament I've run. That's nearly 400 days of running tournaments!) Don't miss the great promotional video below, put together by Mossa Barandao of Pongmobile! They both finished over the weekend. See the results, read the articles, and watch the videos and pictures! Here's the ITTF home page for the ongoing event taking place in Oxenford, Australia, April 5-15. I probably won't keep linking to this every day, so save the link! I'll link to it again when it's finished so we can browse the results, articles, pictures, and videos. Here's the article from Samson Dubina, which covers how to deal with balls that barely come off the edge of the table. Here's the article by Eli Baraty on the discipline it takes to improve, including commitment, hard work, and drive. Here’s chapter 23 of Tim Boggan’s latest volume, which covers 1993-1994. Or you can buy it and previous (and future) volumes at www.timboggantabletennis.com. Chapter 23 covers "Mar/Apr 1994 - Off Table News." Note that Volume 21 is now out. This volume is 438 pages with 1667 graphics, and covers all the wild things that happened in 1994-95 - and I'm mentioned a lot! Why not buy a copy - or the entire set at a discount? Tim sells them directly, so when you order them, you get it autographed - order your copy now! Here's the article by Richard Finn. "Recently more than 50 California junior players had the special privilege of meeting and playing with a dozen top Chinese junior players at the 2nd Annual Capital Plastics Tournament hosted at the California Table Tennis Club in Rosemead on March 17-18." Here's the ITTF article on India winning Women's Teams at the Commonwealth Games, upsetting Singapore in the final. Here's the video (2:31) of their physical and table practice. 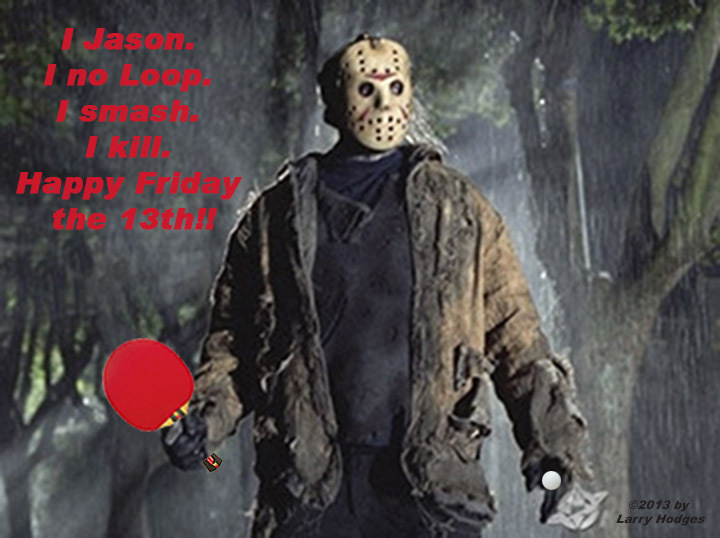 Here are a few of the better World Table Tennis Day (April 6) links I came across. Ten Players, One Table, No Problem (29 sec)! Here's the video (18 sec)! Here's the video (60 sec)! That's Cory Eider he's rallying with at the end with "one-paddle pong." Here's an example of how players are often developed in China. Cheng Yinghua, one of the head MDTTC coaches, from age 5 to 12 trained eight hours a day at table tennis (also training in badminton before that was dropped), with only one hour of school. After that, starting at age 12, he was full-time table tennis, no more school. He became one of the best players in the world, and was on the Chinese National Team from 1977-1987. These days school is considered more important in China, and fewer players go the extreme route of someone like Cheng. But long hours with top coaches - this is how top players develop and how they are made. How can USA develop its own players and turn into a powerhouse - maybe even competing with China? Here are five keys. Keep opening up training centers. That is a BIG key. MDTTC was the first successful full-time table tennis training center in the U.S. when it opened in 1992, and as of 2007, there were only eight. Now there are 93. This is why our top cadets and juniors are now competitive with the rest of the world, where before they were rarely so. This is what leads to the level and depth of players needed to reach the highest levels. Focus first on reaching #2 in the world. Then we can turn it into a USA vs. China battle, and go for #1. Yep, that means we have to catch up to the rest of the world, other than China. But that's at least foreseeable, while beating China isn't at this time. But once you reach #2 and have just one more barrier to break through, it becomes foreseeable. Don't be pale copies of the best Chinese. We need to take what they and the other best players in the world do and expand on it. That's what every new generation of players has done since the 1920s. We tend to coach players to match the current best players, which is mostly successful, but it's the ones who expand on what the current best players are doing that will become the next generation of best players. Serve and receive are especially areas open for innovation. Sometimes learn from the past. For example, Waldner could tie up opponents in every rally - no one was comfortable against his variety of deceptive and change-of-pace shots. Take that, add the best of modern top players, and you have someone who will beat the best Chinese. But because such "unorthodox" play develops outside of "orthodox" training, that type of variation game is often forgotten, despite its obvious success. You can order your copy now! This volume is 438 pages with 1667 graphics, and covers all the wild things that happened in 1994-95 - and I'm mentioned a lot! (Plus a good portion of the volume is from articles I wrote back then - I was editor of USA Table Tennis Magazine.) Why not buy a copy - or the entire set at a discount? Tim sells them directly, so when you order them, you get it autographed! Here it is - I'm the editor for the 71st issue in a row. Here's the ITTF home page for the event taking pace April 6-8 in Yokoyama, Japan. There's already one shocker - Bigger they are, harder they fall; Tomokazu Harimoto beats Fan Zhendong. Here are highlights of the match (1:29). Here's the ITTF home page for the event taking place in Otocec, Slovenia, April 2-6. The dates caught me off guard this morning - I assumed it was this weekend, but they are already past the preliminaries (Mon and Tues) and into the main draws starting yesterday. Here's the ITTF home page for the event taking place in Oxenford, Australia, April 5-15. Here's the video (4:26). "Which commercial do you like the best?" Here's the USATT Facebook page, which links to video and pictures from the national training camp going on there this week, Mon-Fri, ending today. Most of the top junior players in the country from ages 9 to 14 or so are there. Here's a link to video of practice matches yesterday (53:51). Here's the video (2:51). "Very few sports work the game, researchers will tell you, as much as the game of ping-pong." Is this the world's biggest collection? Here's the video (9 sec), with Dimtrij Ovtcharov and Super Baby! Here's the video (3:20, with "table tennis" only in the first six seconds) - this is NOT a smart thing to do! As noted in my blog yesterday (second segment), I'm having major shoulder problems. They have been ongoing since October, but became dramatically worse in December at the U.S. Open when I went for a big forehand and tore (or technically "frayed") my rotator cuff. That, along with shoulder tendonitis, bursitis, and extremely tight muscles, mean I won't be doing any private coaching for a while, as explained in the blog. So guess what's on my todo list sometime over the next day or so? I plan to stop by the club and practice feeding multiball left-handed. I've never even tried doing this. I'm not particularly good playing left-handed - I occasionally switch hands when I'm way out of position and either lob or soft-spin a lefty shot, but I'm probably about 1100 overall that way. I've been shadow-practicing feeding multiball left-handed the last few days, and while I'm not too confident I'll be able to feed multiball very well that way, it's worth a try. One option is to do most multiball right-handed, but switch hands (and sides of the table) when I need to feed backspin. But can I learn to do this (with practice) at a high enough level to be effective? Have any of you ever tried switching hands to feed multiball? Or, due to injury to your playing arm, learned to play with your other arm? I absolutely am NOT going to do the latter, but lefty multiball might be a temporary solution. Here's the ITTF home page for the event taking place in Otocec, Slovenia, April 2-6 (Mon-Fri). The dates caught me off guard this morning - I assumed it was this weekend (perhaps starting today), but they are already past the preliminaries (Mon and Tues) and into the main draws starting yesterday. Here's the ITTF home page for the event taking place in Oxenford, Australia, April 5-15 - it starts today. Here's info! This is for players in my region, at the Maryland Table Tennis Center in Gaithersburg, MD. How Do I Choose The Right Ping Pong Paddle For My Playing Style? Will Ma Long Win Tokyo 2020? Here's a great Facebook posting by EmRatThich. Alas, you might not be able to read it if you are not on Facebook - not sure. If you can't read it and DESPERATELY want to, email me and I'll email you the text. Power of World #1 Fan Zhendong! Here's the video (4:12) from EmRatThich. Here's the video (8:10) - but the part I like is the great ping-pong ball animation in the first 25 seconds! Here's the video (34 sec) - and watch the kids' heads go side to side! Here's the picture! (Here's the non-Facebook version.) I just added this to my Skeleton Pong listing in my March 30 blog. Head Chinese Coach??? April Fools! April 1, 2018 - I'm hired as the Head Chinese Coach!!! April 1, 2016 - Ping-Pong for Quitters – My New Book! April 1, 2015 - My Next Table Tennis Book - "Ping Pong for Quitters"
Yesterday I sent the following email to all my students. Alas, I won't be doing any private coaching for a while, just group sessions. I'll also have to withdraw as a player from the World Veterans Championships (though I'll still be there doing coverage), and I won't be playing at the Nationals (though I'll be there coaching and attending meetings). Alas, it looks like I won't be doing any private coaching for quite some time, at least until the fall. I've been undergoing physical therapy on the shoulder for six weeks now, but it's going to be a lot longer. For now, assume I'm retired from private coaching, though I'll continue to run group sessions. On Saturday I tried doing a two-hour multiball session. Feeding topspin isn't a problem, but feeding backspin repetitively puts a strain on the shoulder, and after 90 minutes I had to cut the session short as the shoulder was badly aggravated. Even before that the shoulder had been hurting. I also tried regular hitting, and while I can do it at a slow pace, as the pace goes up and as balls spray around, it puts a strain on the shoulder, which aggravates the injury. I saw the doctor again yesterday. I was convinced I needed surgery, but he explained why I can't yet. I have a frayed rotator cuff, plus tendonitis and bursitis, plus abnormally tight shoulder muscles. My range of motion in the various shoulder muscles are all under 50% normal. The problem is that the tight muscles are pulling at the rotator cuff (impinging it), and that's why it hurts, and why playing will further injure it. So I have to continue the therapy which is primarily aimed at loosening the muscles. Once that's done, then either I'll be able to play again somewhat normally, or that's when we may consider surgery. But surgery now, he said, would not help since the tight muscles would continue impinging on the rotator cuff. Here's their announcement - they open in Glen Head, NY, this Friday, April 6. Here's the ITTF article on Quadri and the Commonwealth Games. The 2016 Korean Open - Championship goes (due to a) South(paw), by Robert Ho. Here’s chapter 22 of Tim Boggan’s latest volume, which covers 1993-1994. Or you can buy it and previous volumes at www.timboggantabletennis.com. Chapter 22 covers "Mar/Apr 1994 - International Tournaments." Here's the picture! (Here's the non-Facebook version.) Yes, the paddles are bigger than the kids!